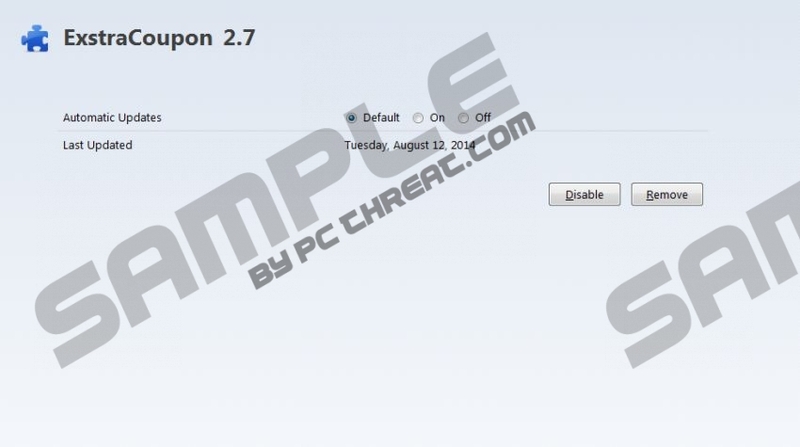 ExstraCoupon is yet another adware application that might enter your system if you are not careful installing software onto your PC. It is marketed as a browser add-on that will provide you with numerous handy online deals that will save a significant amount of money while shopping online. Unfortunately, just like so many other adware applications ExstraCoupon will not do what it promises. Most likely you will be provided with mostly worthless ads and pop-ups while browsing the web. If you do not want to take the risk of getting infected by other infections, you need to remove ExstraCoupon without any hesitation. The article explains why removal of ExstraCoupon is essential and provides virtual security tips that should be useful in order to avoid other potentially malicious applications in the future. Once ExstraCoupon enters your operating system, it will install browser extensions to Internet Explorer, Mozilla Firefox, and Google Chrome. These extensions are installed without any authorization. Therefore, it is possible that you might not even know that they were installed. They are used by the application to display various adverts and pop-ups. Certainly the ads and pop-ups provided by ExstraCoupon are annoying and bothersome but that is not the worst thing about them. Some of them might contain various redirect links within them. That is so because the malicious extensions are interacting with various adware servers to provide the ads, and those servers are known to be linked to malware distribution. So you might get redirected to a fake online store. You might be lured into clicking an ad with a very tempting offer. Often such web stores are unknown to the majority of the users; thus, if you encounter one like that try to learn about it as much as possible before purchasing anything from it because such webs stores are setup by cyber criminals in order to steal your sensitive data. The possible exposure due to ExstraCoupon could turn out to be detrimental, to put it mildly, and that is why we strongly advise you to remove ExstraCoupon immediately. The removal of ExstraCoupon includes a few simple steps still it should be carried out with utmost caution. We recommend rechecking your system for any potential leftovers of the infection after manual removal. Use the provided list of files, folders, and registry entries associated with ExstraCoupon to make sure that the adware program was removed entirely. Otherwise, we recommend using a licensed antimalware tool for removal and security proposes. Then type Control Panel into the text box. Locate ExstraCoupon and the double-click it to get rid of it. Tap Windows key+Q on your keyboard. Then type Control Panel into the search box and tap Enter. Select ExstraCoupon and click Uninstall. Remove ExstraCoupon from your system. Quick & tested solution for ExstraCoupon removal.